BIRMINGHAM, AL - The Tennessee Smokies (6-3) stormed back from an early 6-0 deficit to take down the Birmingham Barons (4-6) 7-6 and win the rubber match in Birmingham on Sunday night. Birmingham jumped out to a commanding 4-0 lead in the first inning. Luis Gonzalez got the Barons on the scoreboard first with a line drive single to bring Joel Booker home. A single and double later, Yermin Mercedes would conclude the inning with a run scoring single. In the third inning Birmingham would extended their lead to 6-0 after a Gavin Sheets' run-scoring double and a Trey Michaelczewski single to bring Sheets home. The Smokies catapulted themselves back in the game with a six run performance in the fifth inning. Jhonny Pereda and Connor Myers hit back-to-back solo home runs to start the rally. Run-scoring doubles from Charcer Burks and Roberto Caro tied the game at 6-6. The difference in the game proved to be an unforced error. A costly wild pitch from Barons pitcher RHP Danny Dopico (L, 0-1) sent Caro home in the eighth inning to give the Smokies their first lead of the game and cap off seven unanswered runs. 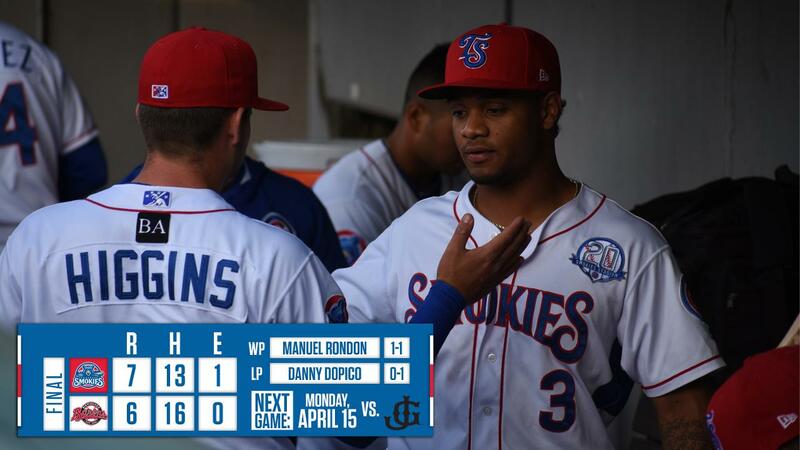 LHP Manuel Rondon (1-1) picked up his first win of the season for the Smokies, and RHP Craig Brooks (S, 3) grabbed his Southern League best third save on the season. 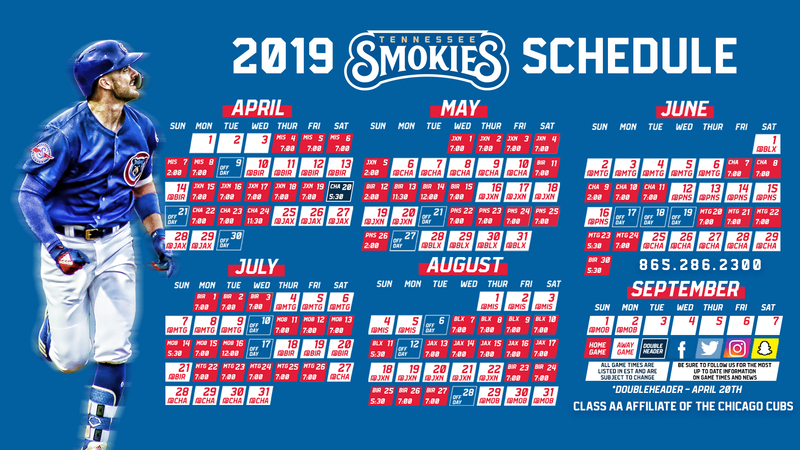 The Smokies return home for a 10-game home stand starting with a five game series against the Jackson Generals beginning Monday at 7:00 pm ET. RHP Tyson Miller will get the start for the Smokies and face off against RHP Bud Jeter. It is the first Dollar Dog Monday of the season presented by M3 Technology Group. Hot dogs and all 12-ounce fountain drinks are just $1 all night long.